When news broke at Sydney Contemporary that Bill Nuttall at Niagara Galleries had just sold Rover Thomas’ Kukatja, Wangkatjanka/ Woolanguwa, reputedly for $300,000, there was a collective industry cheer. Not only is the stalwart dealer highly regarded and well-liked, but the important work was crisp, rewarding and thoroughly deserving of the result. It also perfectly sums up the mood of the market over the last 6 months. When you look at the total auction results for Indigenous art in Australia this year, $6.024 million to date, you could be forgiven for thinking the market isn’t that strong compared to previous years. But it has been a most productive year, it just hasn’t appeared that way at auction. So with the private market for Australian Indigenous art firing, what’s going wrong at auction? The problem, in my opinion, stems from the trend in placing increasingly low auction estimates for important artworks. Even though the secondary market for Australian Indigenous art took a positive turn well over 2 years ago, Australian auction houses still seem intent on a ‘race to the bottom’ when it comes to placing practical estimates for significant artworks at auction. I understand that getting these estimates enticingly right is so important, but when you begin to analyse the secondary market results, and the fact that Australian auctions are clearly losing market share, estimates that are set too low are now the main point of contention when selling significant Indigenous works by auction in Australia. Why would a vendor take something significant to auction with estimates of say 40-60k or 60-80k, when they can sell it by private sale for $80,000 or $100,000 with less commission payable and no risk? The trend is increasingly pushing many of the most important artworks towards private sale. In August, Deutscher and Hackett had what was described as a successful auction for Australian Indigenous art (combined with non-Indigenous art), achieving over 83% sold by volume for the Indigenous component alone. But when you begin to dissect the results, that success can only be skewed so far. In my opinion, the estimates for two of the most significant works by Rover Thomas and Emily Kame Kngwarreye where set far too low and did not generate spirited bidding (which is what low estimates are designed to do right – ‘set them low and watch them go’ as they say). Well they didn’t ‘go’ and two very lucky buyers bought exceptionally well. The blue, late period Emily, which was featured in the Jennifer Isaacs Emily book, was an absolute steal at the price paid - $54,900 including Buyer’s Premium. This result highlights that for great Indigenous artworks, auction houses need to start placing firm but realistic auction estimates - in line with the market - or risk losing further market share. It’s that simple. Deutscher and Hackett’s final offering for 2019 took place in Melbourne last week, led by a highly important collection of drawings from the Baudin Expedition - which sold predictably well. Of the 31 Indigenous lots offered, 25 sold which amounted to a total of 81% by lot. It was a solid offering which was met by a solid response. Astonishingly, a large canvas by Emily Kame Kngwarreye and a superb 1973 board by Anatjari Tjakamarra appeared in Sotheby’s Australia’s Decorative Arts sale – recently rebranded as ‘Treasures’. Why these two significant paintings were placed in a decorative arts sale is beyond me. And with the results now in - the Emily did not sell and the Anatjari sold cheaply post-sale for $61,000 including buyer’s premium - it becomes even more bewildering to me. Sotheby’s Australia is now clearly losing its market share - once having a strong-hold on the entire Australian Indigenous art market - and this only bodes well for the Sotheby’s London auction moving forward. All attention will now be on this most important sale. Not only giving international exposure, but pitching Australian Indigenous art against some of the greatest contemporary art in the world - where it belongs. Of the handful of Indigenous works in the Bonhams catalogue last month, two very handsome boards from the Guthrie collection stood out. Both paintings were again underestimated - and whilst the Long Jack Phillipus did attract spirited bidding (including from myself) and sold for the second highest auction record for the artist - $70,760 including Buyer’s Premium, the other important work by Timmy Payungka did not garner a bid - and was withdrawn by the vendor during post-sale negotiations. 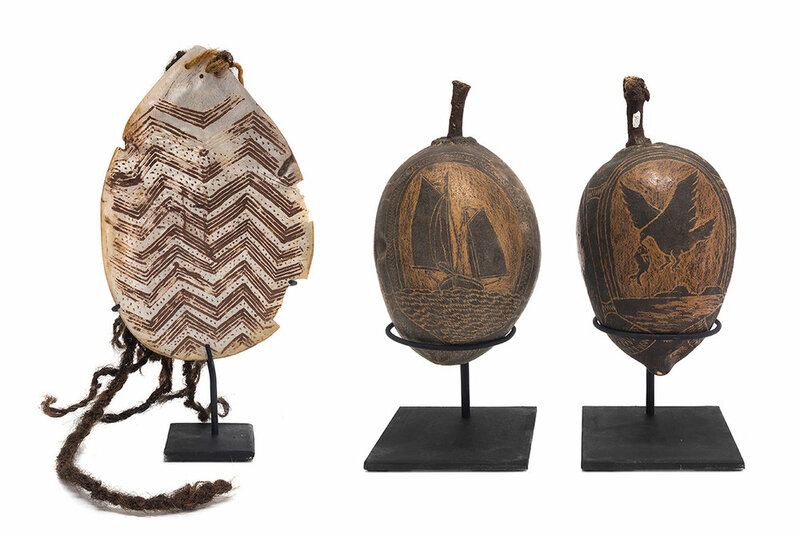 Several items scheduled for auction at Leski Auctions, SIEZED BY VICTORAN ABORIGINAL HERITAGE COUNCIL FOR BEING SO-CALLED ‘ANCESTRAL REMAINS’ (LEFT) AND ‘SECRET AND SACRED’ OBJECTS (RIGHT). Another auction to make waves (albeit for the wrong reasons) was the unprecedented stoppage and seizure of an artefacts sale at Leski Auctions in September. I’ve had many calls about this, and as it will be a matter before the courts, I won’t comment on the details. But I will say that from our whitewashed history, since European settlement, governments have consistently put in place legislation that thwarts stability and viability for Indigenous communities and culture in the modern world - legislation that only further ostracises the people. Surely we are beyond this. What keeps me buoyed, though, is the quality of the work coming through and the fact that these actions simply do not reflect the objectives of the broader Indigenous communities. If the government was truly intent on generating reconciliatory measures with our significant Indigenous people, it would put in place a constitutional Indigenous body along with legislative measures that are actually designed to allow the people and their culture to flourish through productivity - keeping communities and their culture strong. I’m pleased, at least, that the overall market is now much more mature, and the sophisticated collector understands the importance that this political ‘back story’ generates - which, in time, only makes the artwork and their story all the more powerful. I’ll also briefly mention Cooee Marketplace, who are persisting with their auction model. Their sale this week produced mixed results in line with its offering, but one thing was clear - the quality works backed with impeccable provenance shone through and performed well. A couple of notable results include a highly important Papunya board by Tim Leura which sold for $95,000 + Buyer’s Premium, and a well-resolved painting by Ronnie Tjampitjinpa with Papunya Tula Artists provenance which smashed its ridiculously low pre-sale estimate of 6-8k - selling for $22,000 + Buyer’s Premium. Private sales have been driving the market in 2018 - I can personally report over $4 million in private sales this year alone. And even with the uncertainty that a change in Prime Minister creates, along with other market volatility, this latest December quarter will be no different - mainly because of a continued international buying strength. Strong sales by other leading dealers include: Vivien Anderson Gallery’s near sell-out exhibition of Patju Presley’s work, Tim Klingender sold a handsome early Papunya board by Johnny Warangula for $200,000, Alcaston sold a major large-scale work by Sally Gabori at SCAF, Utopia Art sold a significant 6x8 work by Yukultji for $110,000, not to mention the highly publicised record sale of John Mawurdjul’s Ngalyod that we sold for $140,000 at in September. Taking advantage of this momentum in the private market, I’ve got big plans for next year that will be announced very soon - so stay tuned. In the meantime I’d like to personally thank all of you that have helped support and enjoy this vibrant market that we all love and cherish. If you have any queries or need any advice with buying and selling, feel free to contact me at anytime. There is no better way to experience and learn more about Australian Indigenous art than to see it in person. I always have an interesting array of artworks on display at my offices in Armadale - and you are welcome to make an appointment for a private viewing and talk about the works and/or the market at anytime. So get in touch!